It’s interesting to observe travel patterns of the flying public. The ebb and flow in a heat map of the most popular destinations would be fascinating to observe over time. Despite a half hour of searching, I found no such data on the internet. The closest thing I came across was the featured image for this post, a heat map of the most frequently photographed locales courtesy of sitesmap.com. A couple of years ago, the hot spot for charter travel seemed to be London. The Queen’s Diamond Jubilee, the 2012 Summer Olympics, and the Paralympic Games all took place in London within the span of just a few months. As a result, I was in England almost as much as the United States. Or so it seemed. In the charter world, you see this smaller versions of this phenomenon occur all the time. 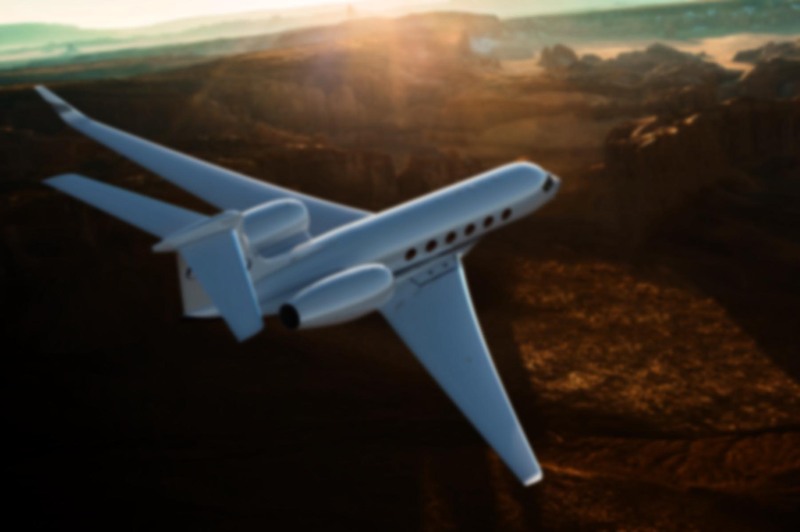 Whether it’s the World Economic Forum, the Superbowl, or the State of the Union, large numbers of private aircraft congregate at these events. It’s not uncommon to find friends and co-workers both past and present showing up at the same places over and over again. It goes a long way toward making the world feel like a smaller place. If my sought-after heat map existed, 2014 would see a scorching red area around the eastern coast of South America. The world’s attention has been focused there because of the FIFA World Cup, and it will shortly return to Brazil for the 2016 Summer Olympics in Rio de Janeiro. Beyond those events, the whole Latin American area has been on an economic upswing while Europe and North America still grapple with the lingering effects of the 2008 financial crisis. Years of growth have spawned a thriving middle class. The World Bank estimates that between 2003 and 2009, the percentage of Latin Americans living in poverty fell from 44% to 30% while the number of middle class Latin Americans rose from 103 million to 152 million. That expanding middle class has more disposable income than ever before. Robust domestic demand has been key to helping Latin America weather the global economic turbulence of recent years. This trip was similar to the one I made to Salvador last year: the same airplane, crew, passengers, and destination. And just like last time, the overnight trip down from New York took a while to recover from. The other pilot said overnight flights are tough even when you’re on a regular schedule of night flying. “You can feel it sucking the life out of you,” he said. After a day of rest, there was plenty of time to explore a different part of the city. Last time our hotel was in the middle of town, whereas this time the resort was further away, located inside a gated community with expensive homes and a miles-wide private beach. I didn’t mind the trade-off at all. 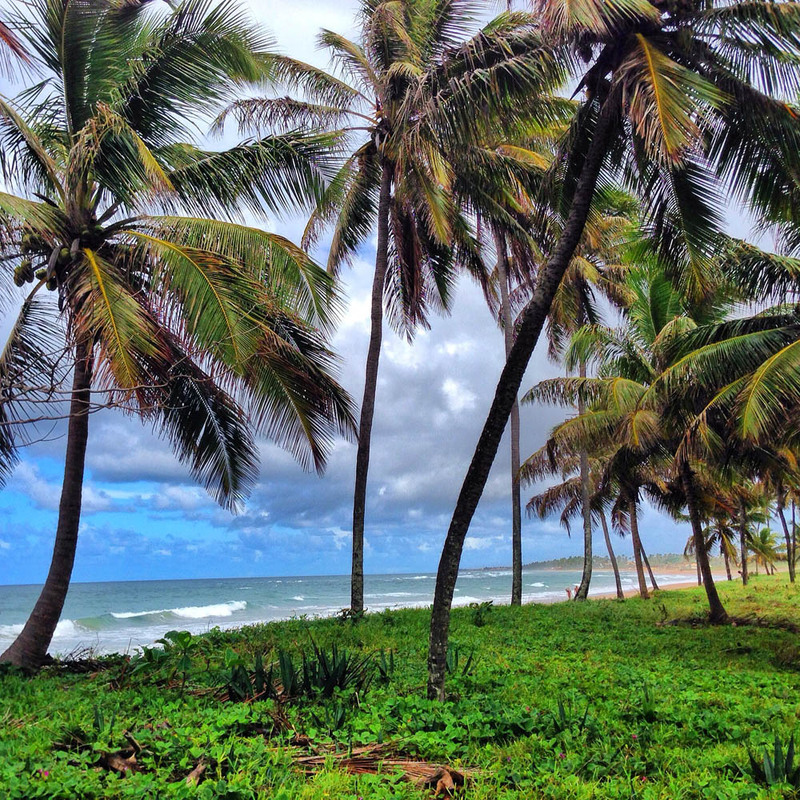 The jungle gave way to a beautiful expanse of private beach just across a small bridge from our hotel. One major difference from the last trip was the added complexity associated with flying during the World Cup. If you think the Superbowl generates a lot of air traffic, consider the month-long duration of this soccer tournament and the fact that it takes place at cities all over the country. A team might play in Brasilia one day and Salvador on another. As they move about the country, so do their legion of fans. It’s like the Olympics on steroids. In fact, I queried Brazilian citizens throughout the trip about which of the two events they felt would be “bigger”, and every one of them thought the World Cup would easily outshine the Olympics. That probably says more about their passion for football than anything else. Brazil is always a World Cup contender, whereas they’re not a particular powerhouse in either the summer or winter Olympics. A few days after we arrived in country, we had a quick trip to drop off a passenger in Sao Paulo and return to Salvador empty. Because of the limited slots available, we had to stick around in Sao Paulo for nearly eight hours before our departure slot time came up. The handler offered to run out and get us some food since we couldn’t get a cab to come pick us up. When the handler returned, he said there were tons of cabs all around the airport — and they were all empty! As soon as the Brazil game started, people abandoned their jobs, cars, and whatever else to watch the match. He said cars were just sitting there as though the people had vanished off the earth. We watched the game from the FBO lounge at Congonhas Airport, and every time Brazil would make a good play, you’d hear mortars, firecrackers, and other explosions going on around the city. It was like a happy war zone. And the airport? Congonhas is one of the major commercial airports in Sao Paulo, a city of more than twelve million people. The game lasted nearly two hours, and I don’t think a single airplane came or went during that time. It was really weird. Flying to Brazil always involves permits, but the World Cup added takeoff and landing slot reservations, parking hassles, and general administrative largesse to the mix. Taxes are levied for every leg, and flight plans are not accepted until those taxes have been paid. The company we used for those services dropped the ball on a couple of occasions, but thankfully FBO in Salvador was probably one of the best on the planet, and they managed to save the day for us every time. That FBO is AeroStar. I can’t say enough good things about these folks. When we couldn’t get a clearance because taxes hadn’t been remitted by Universal, the FBO manager personally went to the tower to straighten things out. It wasn’t even their responsibility to pay those taxes, but they did it. When we needed to replenish our potable water supply and didn’t want to risk using local water sources, they obtained large quantities of bottled water and manually filled the tanks with a hose and funnel through a tiny gap between the top of the tank at the enclosure surrounding it. When our vacuum cleaner died, they assembled a ridiculously long extension cord and insisted on cleaning every inch of the airplane for us with their own shopvac. They spot-cleaned leather seats. They made sure we had the best parking space on a very crowded ramp, and were always there to help with fueling, staging, and somehow had whatever we required before we even knew we needed it. We had brought down a towbar for the Gulfstream on the advice of our flight planning company, but AeroStar had a brand new tow bar and head for the G-IV on site, so we never had to fish ours out of the hell hole and cargo compartment. They even insisted on taking us out to dinner while we were in town. They knew us and we were always greeted by name with a smile. I wish every FBO was like this. Speaking of food, you’re probably aware of Brazilian BBQ restaurants — there are plenty of them scattered throughout the United States — but the AeroStar staff took us to a Brazilian cross between a churrascaria and pizza parlor. Skewers of meat are replaced by pizza pans filled with two categories of pie: savory and sweet. There are even little flags built into the table to communicate which pizza style you’re interested in. When you’re ready for a break, you just take down your little flag and they stop inundating you with pizza queries for a while. I felt like John Snow retiring Castle Black’s colors ever time I did that. It’s not really my thing, but some people love this chocolate pizza. Many of the toppings were familiar, but some really threw me for a loop. 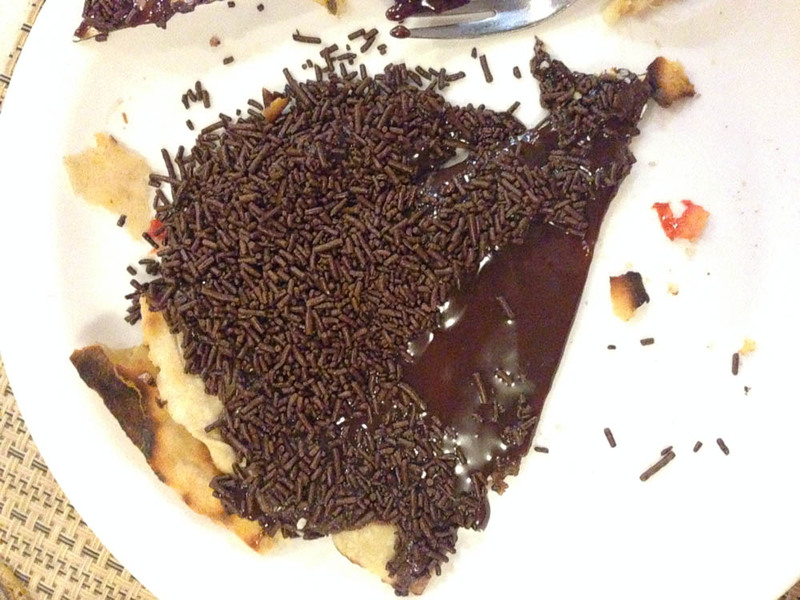 Have you ever had a chocolate pizza? I wasn’t a fan, but the locals seemed to love it. Their take on Hawaiian pizza is also quite different from ours. Instead of pineapple chunks, their iteration was topped with a vaguely spicy, gelatinous pineapple substance. 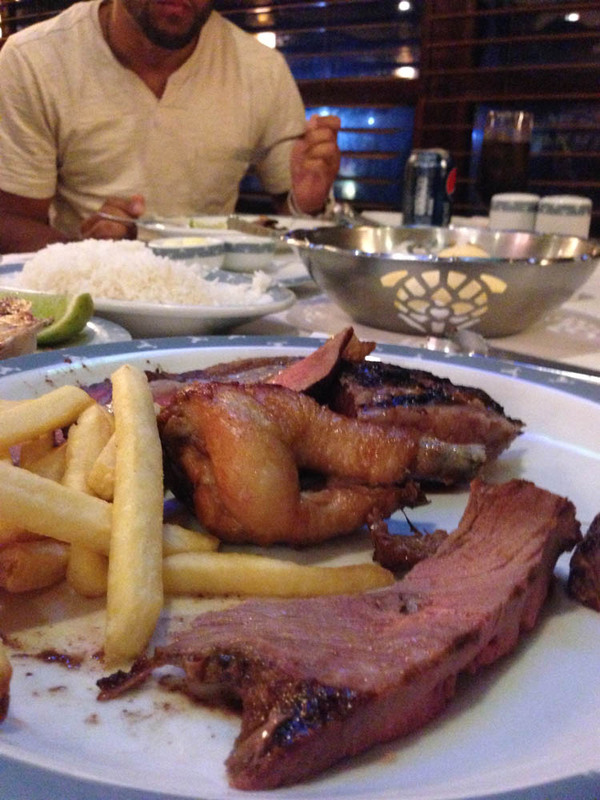 No visit to Brazil would be complete without a meal at an authentic Brazilian churrascaria, and our flight attendant (who’s made something like a half-dozen trips to Salvador in the past year) insisted we try a place called Boi Preto. I’m proud to say I didn’t over-indulge, despite the fact that we were there for about three hours and got sucked into the Ivory Coast / Japan match. What would a trip to Brazil be without at least one visit to a churrascaria? 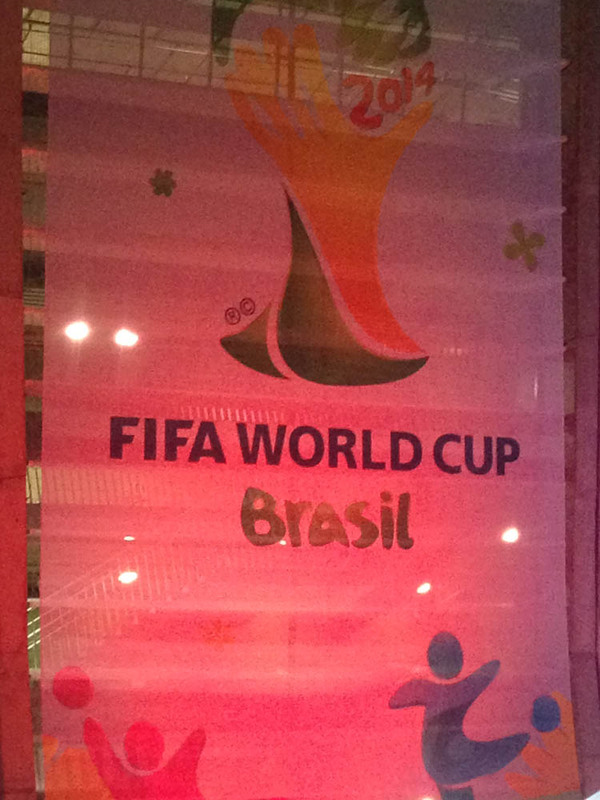 The brass ring for any World Cup trip is, of course, going to see a game. We watched at least a dozen of them on TV at the hotel bar, but it’s not the same as being there. You’d think tickets would be hard to come by, but they are frequently re-sold on the secondary market. You can find them on line, at hotel concierge desks, and even the FIFA web site. But trying to find three tickets that are next to each other? That’s a little harder. Our flight attendant worked overtime and managed to get three seats at decent prices for the Switzerland/France match in Salvador. Later on, we learned that nobody cares where you sit anyway. That would explain how huge blocks of fans always seemed to be sitting together. I should say a word about the tickets because they’re pretty high-tech. Beyond the beautiful four-color imagery emblazoned across the front, these large-format documents also featured holograms, electronics, and the purchaser’s name imprinted on them. Big ticket for a big event, I guess! 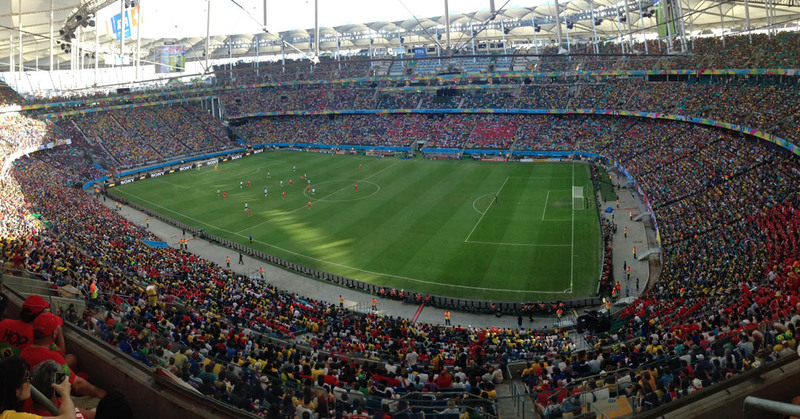 There are no bad seats in the Itaipava Arena Fonte Nova. This was the first soccer game I’d ever attended. For whatever reason, I just didn’t grow up with the sport. I don’t remember ever playing or watching it as a kid. In fact, I’d go so far as to say I knew less about the game than any of the 53,000 people who were in the stadium that day. I know there’s a round ball, and a net you’re supposed to put the ball into. Beyond that, I’m clueless. Still, it was a great experience. Just getting to the stadium was an adventure. A 30 minute taxi ride got us to a shopping mall on the north end of town. From there, we had to find a FIFA kiosk to obtain wristbands which would get us onto a train to cover the last few miles to the stadium. The train was clean and modern, but the areas it traversed enroute to the arena were some of the most depressed I’d ever seen. Known as favelas, these slums seemed to surround the stadium on all sides. Most of them were missing windows, walls, ceilings, or some combination thereof. Crowded together and clearly built without any planning or adherence to building standards, they looked like images of Berlin after World War II. I heard that some visitors were actually renting these favelas because they couldn’t find a place to stay during the World Cup. According to Wikipedia, one in three favelas has no sanitation service. We spent some time trying to decide who to root for. Since we were pretty neutral on both teams, it made sense to cheer for the Swiss, as they’re the poster child for neutrality. Unfortunately, “our team” ended up losing 5-2. Despite Switzerland’s crushing defeat, everyone was in good spirits both during and after the game. The streets were filled with people just happy to be there. Bands were playing, dancers were moving, and French fans waved large flags from atop walls in what looked like a barricade scene rehearsal from Les Miserables. 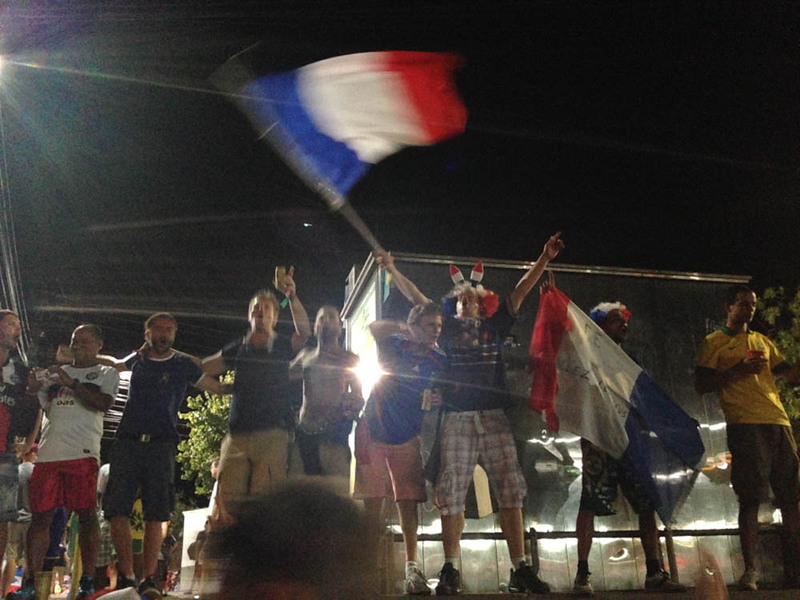 French fans celebrate their victory over Switzerland. Or maybe it’s a scene from Les Mis. Who knows…. The arena itself is very well designed. There are literally no bad seats in the entire stadium. We had category 1 tickets but sat in a category 4 seat and didn’t mind it a bit. I also noticed that there was no scoreboard or clock anywhere to be seen. I can’t think of any other sporting event without at least one of those two items. This trip was even more fun that the first one! I really enjoyed the Bahia Resort, and since we’d been to Salvador previously, we were more at home with everything from the airports to the language. Though I’m not much of a soccer fan, the excitement and camaraderie of World Cup attendees is infectious. With the Summer Olympics less than two years away, I’m sure this isn’t the last time a Brazil trip will land on my plate. This is a frustrating snafu, because I haven’t changed anything about the site, but suddenly things like sending messages and posting comments are extraordinarily slow. I think it has to do with the JetPack plugin, so I’ve disabled it for now just to test out the speed difference.